Today we are taking a look back at Our Daily Bread Designs December Release! 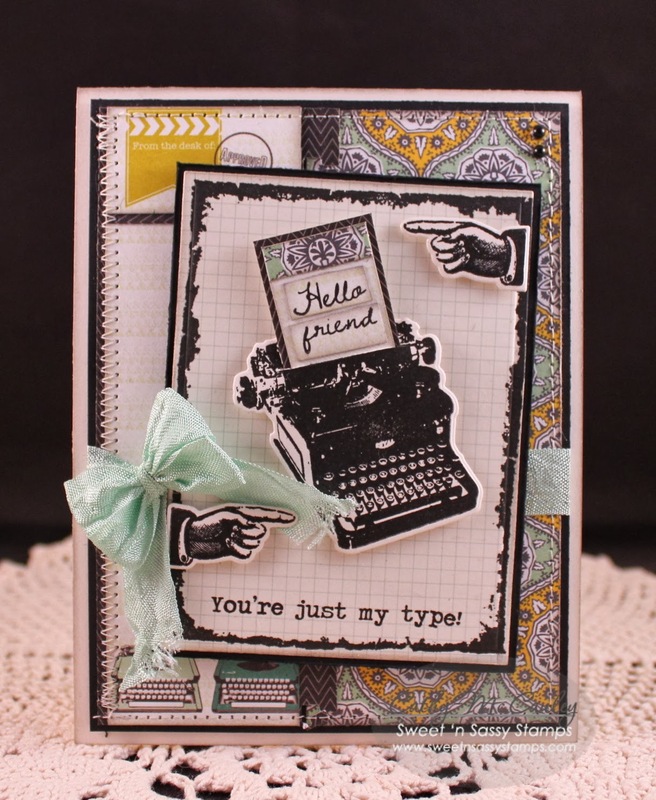 I just love how versatile this release was…all of the stamp sets, sentiment sets, and dies coordinate perfectly. In fact there are elements of each on my card sample for today. Creative Nugget: The Double Z-Fold card base was made with Whirlpool card stock by Bazzill following THIS TUTORIAL on Splitcoaststampers. 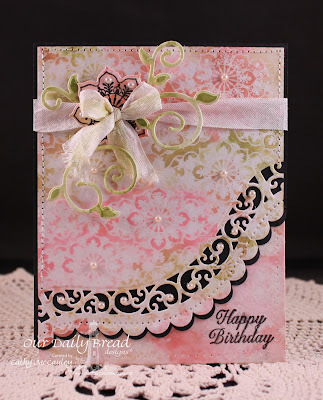 The first layer on the front of the card was stamped with the Ornate Background stamp in Lulu Lavender ink. 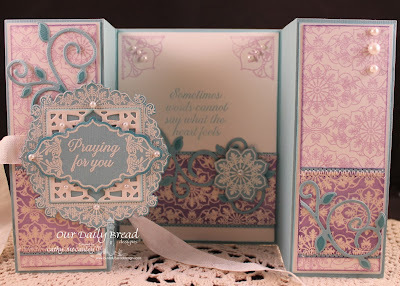 Clear embossing the Ornate Background on Vintage Cream card stock and sponging over it with Dusty Concord Distress Ink created a contrasting layer which was stitched to the front of the card. 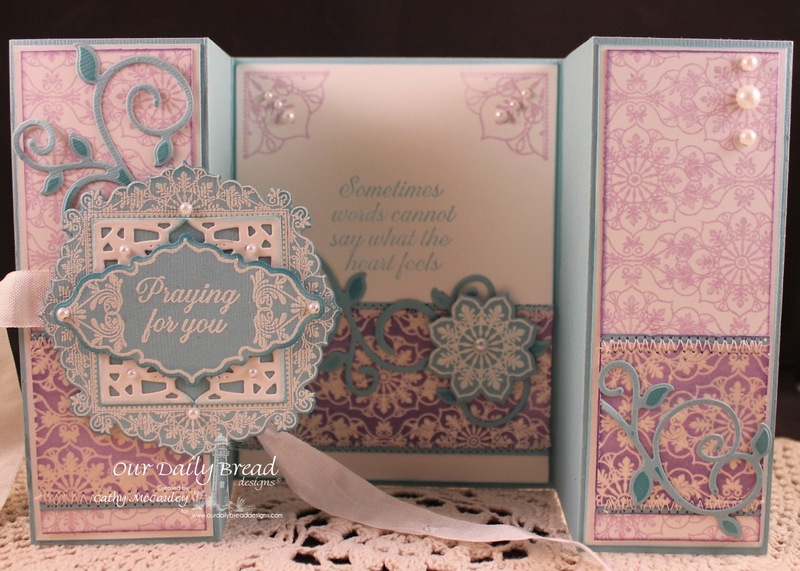 White embossing was used on the beautiful frame from the Ornate Borders & Flowers set and on the sentiment from the Ornate Borders Sentiments set. The matching Ornate Borders & Flower Dies made cutting each layer easy, and I discovered in the process that four of the little corner dies fit perfectly inside the square on the frame. Fancy Foliage Dies and pearls finish the front of the card. A seam binding bow was used to keep the card closed. Here is what the card looks like when opened. The sentiment on the inside is from the No Words stamp set and was stamped in Baja Breeze ink. 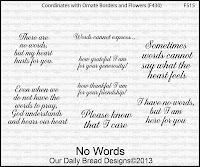 This stamp set is perfect for those times when there are no words to express what is in your heart. For more inspiration using the December Release, be sure to visit the ODBD Blog where you will see all of the designers' projects in one place. To get more details about each project, visit the blogs of all of my talented Sister Sticks! The links are listed below for your convenience. 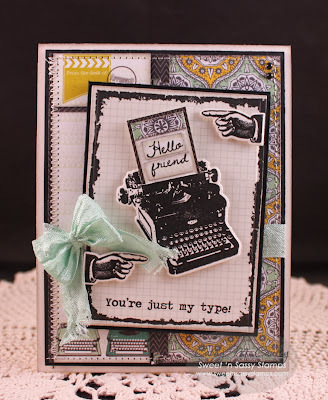 Hello sweet friends…Welcome to Day 4 and the last of Sweet 'n Sassy Stamps December Feature Blog Hops! 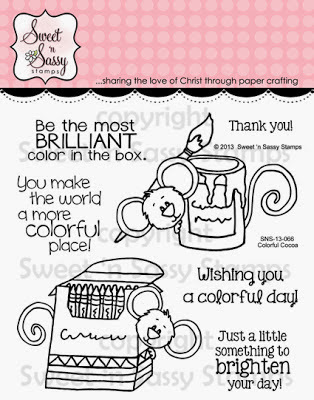 Everyone's favorite mouse, Cocoa, is back making a colorful splash at Sweet 'n Sassy Stamps! 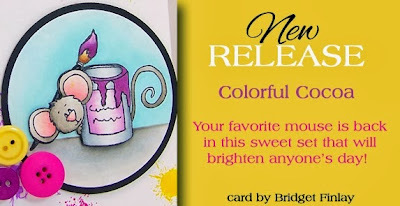 The paint can image measures approximately 2.5" x 2"
Creative Nugget: Three colorful panels were stitched to True Black card stock and mounted on a Solar Crest card base. Brushstrokes of color from the Grunge Elements stamp set were made with a rainbow of distress inks for the panel on the left. Scraps of DP were used for the other two panels. It's difficult to see, but the Typewriter Text Background was stamped on the right panel. 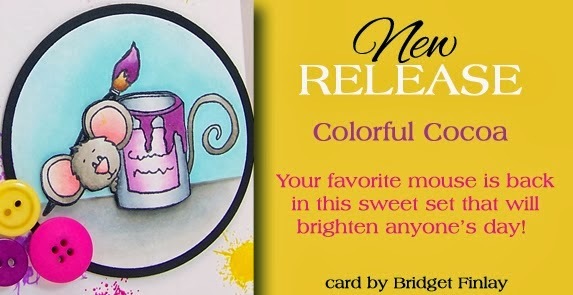 Cocoa was colored with Copic Markers and cut with a Spellbinders Rectangle Nestie. A couple of banners, a button, and pearls finish the card. The design of the card is from this week's Sketch Challenge on Splitcoaststampers. Be sure to leave a comment on each blog along the way because we're giving away (4) $15 store credits (1 winner will be chosen from each of the 4 blog hops). The deadline to comment for a chance to win is Friday, December 13th at midnight EST. The winners will be announced on our website homepage by Monday, December 16th. I hope you've been inspired by this month's feature blog hops. 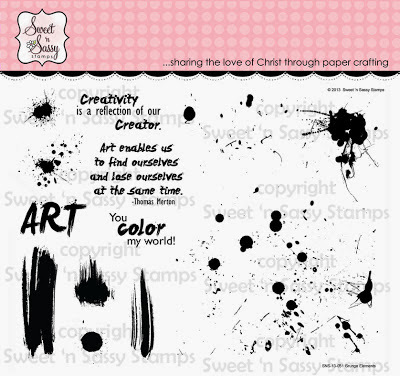 You can find all of these fabulous new stamp sets at Sweet 'n Sassy Stamps! Hello sweet friends…Welcome to Day 3 of Sweet 'n Sassy Stamps December Feature Blog Hops! You will love what the Design Divas have in store for you today! Let's just say that I love the set we are featuring today...so many fun elements that can be added to any card creation for a subtle or bold statement! The word "ART" measures approximately 1.5" x .75"
I'm sure you've been noticing all the ink splats, splatters, and brush strokes on some of the samples posted so far. These elements are all from this fabulous and fun new set. 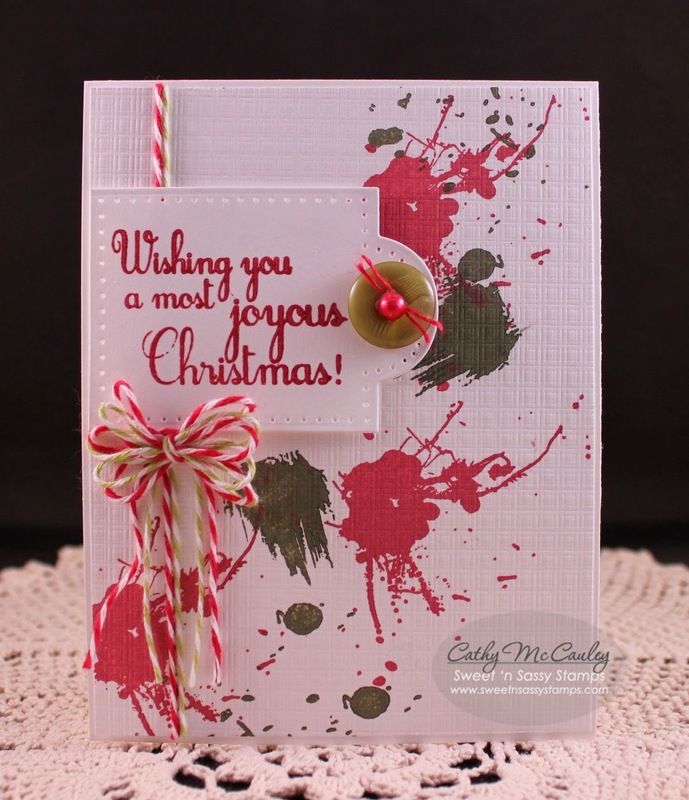 Creative Nugget: The splatters on this fun card were made with the Bouquet Kaleidacolor pad. Matted on black, these colors just pop. Some random stitching and a few buttons finish the card...easy peasy. Oh...the little scalloped border is from the Bookmarks & More die set. Creative Nugget: The ink splatters on this Christmas card were arranged diagonally using Rhubarb Stalk and Olive Grove Memento Luxe pads. The sentiment, from the Mod Ornaments set, was stamped on one of the bookmarks from the Bookmarks & More die set. The bookmark was trimmed, pierced, and popped onto the card. Baker's Twine, a button, and a pearl were added to finish the card. 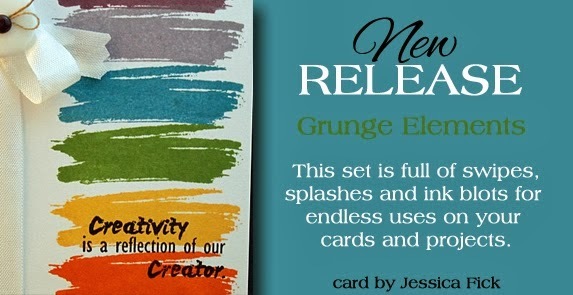 Grunge Elements is a perfect stamp set for any occasion! (1 winner from each of the 4 blog hops). Thanks so much for stopping by! Enjoy the hop and have a restful Sunday! Hello Sweet 'n Sassy friends…Welcome to Day 2 of the December Feature Blog Hops! Creative Nugget: Panels of Authentique papers were stitched to Smokey Shadow card stock and mounted to a Vintage Cream card base. All of the layers were sponged with Brushed Corduroy Distress ink to age the papers a little. The Typewriter Text Background was stamped right on the DP using Basic Gray ink. Do you see the ink splatters? They are from the new Grunge Elements stamp set we are featuring tomorrow...you won't want to miss tomorrow's hop...the samples are fabulous!! 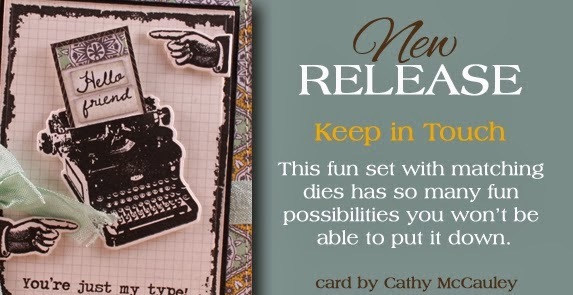 The typewriter from the Keep in Touch stamp set was stamped on the matching die and popped up on the card. The sentiment was stamped on one of the labels from the Bookmarks & More Die Set. A seam binding bow, Heart Pin from Maya Road, and several pearls were added to finish the card. Be sure to leave a comment on each blog along the way because we're giving away (4) $15 store credits (1 winner from each of the 4 blog hops). Thanks for stopping by...Enjoy the hop! 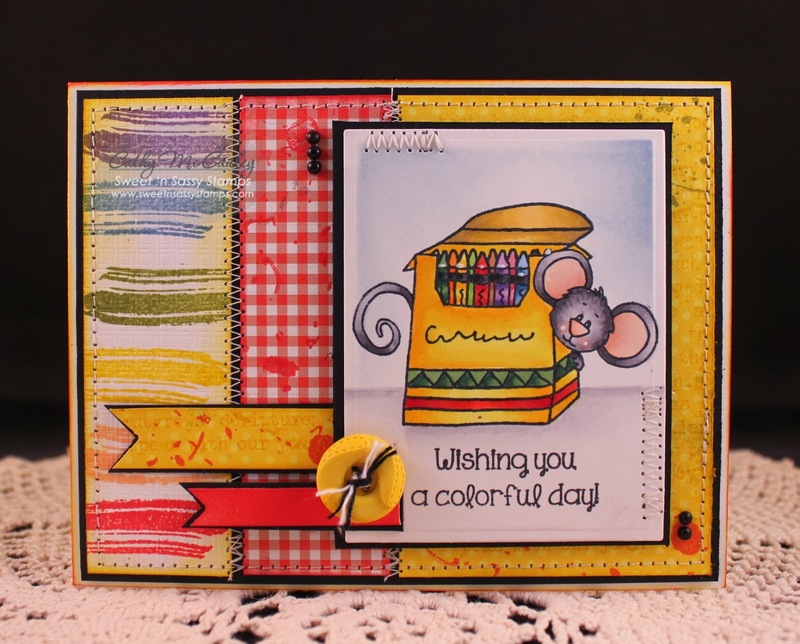 Hello sweet friends…Welcome to Day 1 of Sweet 'n Sassy Stamps December Feature Blog Hops! 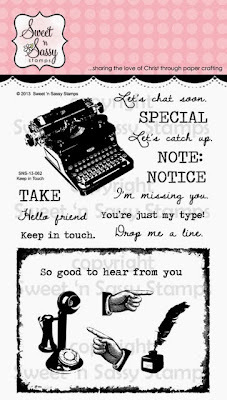 Whether you want to catch up with an old friend or just send a little note to someone special, this versatile set with its vintage images is just perfect! Creative Nugget: The card front was made by stitching panels of Webster's Pages DP to True Black card stock and mounting it to a Vintage Cream card base. 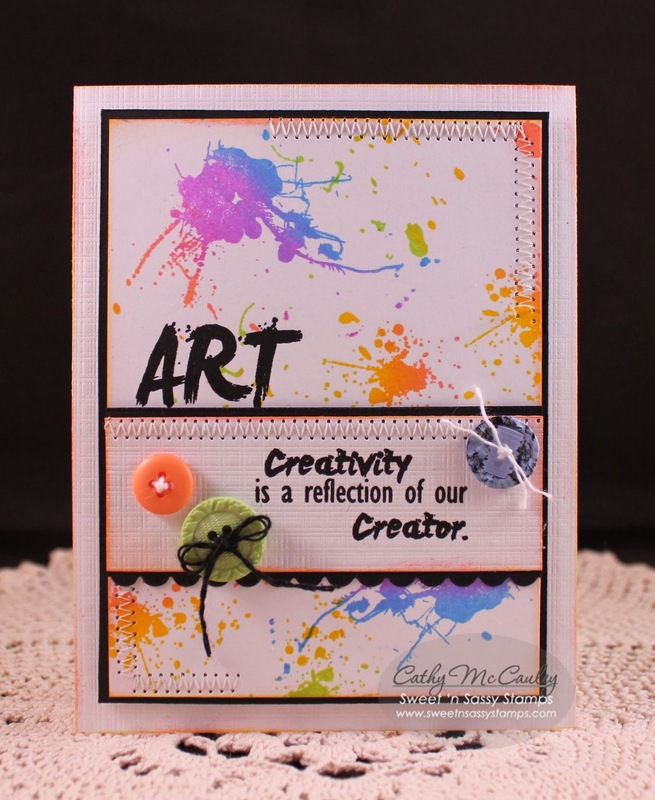 The grunge frame was stamped right on the DP and cut with a Spellbinders Rectangle Nestie. Matching dies made mounting the typewriter and hand images a snap. One of the sentiments was stamped on a little note which was slipped into a slit that was cut in the top of the typewriter. A seam binding bow and pearls finish the card. Creative Nugget: Panels of My Mind's Eye and Solar Crest card stock were stitched to Smokey Shadow card stock and mounted to a Smokey Shadow card base. 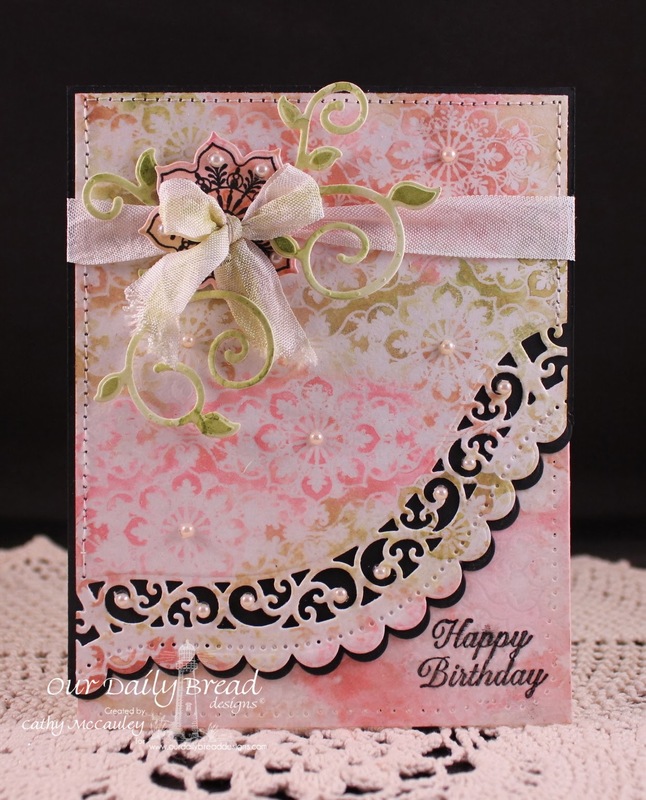 A little scalloped border from the Bookmarks & More Die Set separates the panels on the top layer. The phones were die cut and stamped with colors found in the DP. The phones were cut again out of Smokey Shadow and off set a little to create depth. 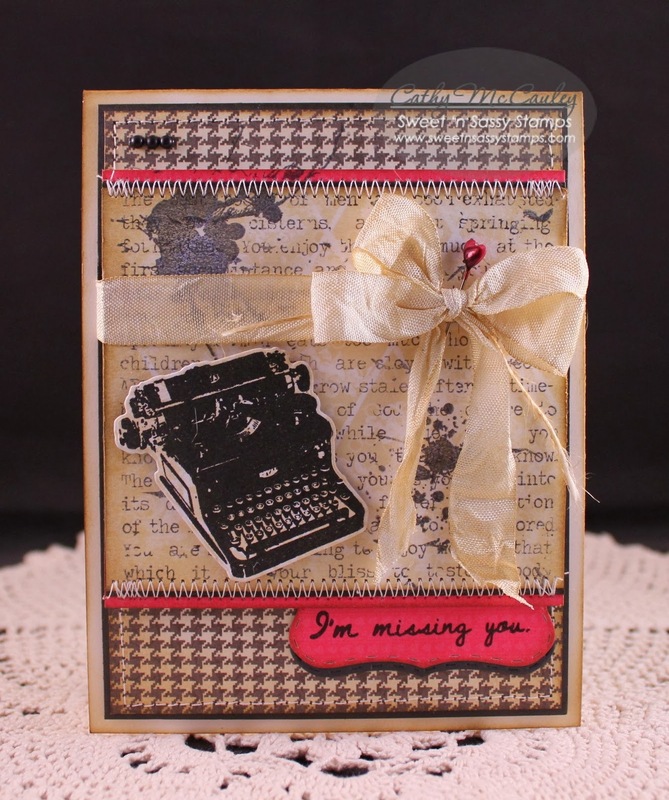 One of the sentiments from the set was added as well as some Baker's Twine and a button to finish the card. The deadline to comment for a chance to win is Friday, December 13 at midnight EST. The list of winners will be announced on our website homepage by Monday, December 16th. Thanks so much for stopping by! Enjoy the hop and be sure to come back again tomorrow for Day 2! Hello friends! Can you believe it's December already? 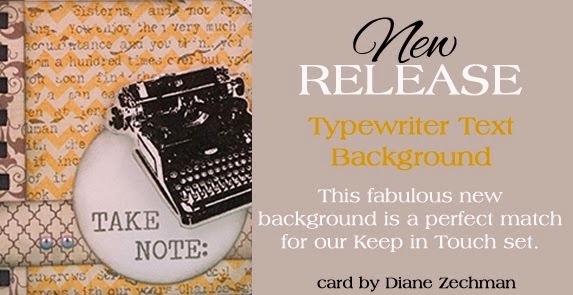 It is...and it's time for a new release by Our Daily Bread Designs. I LOVE stamp sets that are versatile and can be used year round! 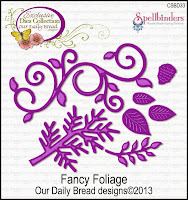 The December release by Our Daily Bread Designs fits that bill perfectly! 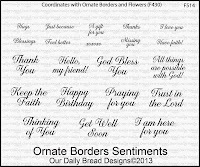 One stamp set, two sentiment sets, a background, and matching dies all coordinate to make creating cards for any occasion, from elegant to clean and simple, a breeze! 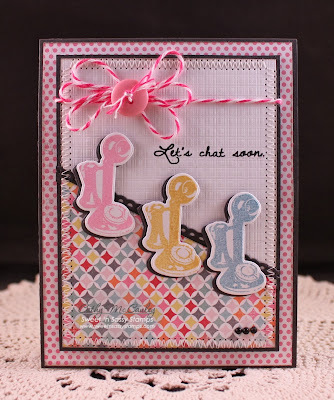 Just visit all of the designers' blogs for a sampling of the many ways these gorgeous stamp sets can be used. Three winners will be randomly chosen from one of the designers' blog comments to receive a $25 Gift Certificate to the ODBD Store to be used toward the purchase of ODBD Stamps. You have until December 2, 2013 at 9:00 p.m. EST to make your comments! The winners will be posted on the ODBD Blog on December 3rd, so be sure to check back there to see if you won! 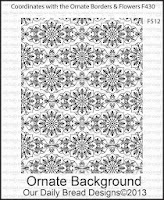 My first two samples use the Ornate Background, Ornate Borders and Flowers, Ornate Border Sentiments, and the Ornate Borders and Flowers Dies. 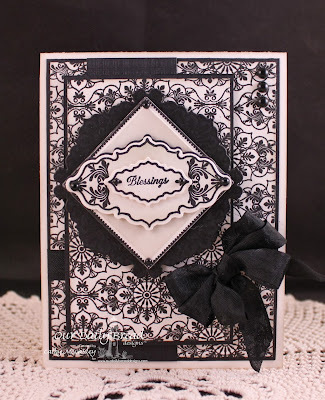 Creative Nugget: Elements from the stamp sets were simply stamped in black on Vintage Cream card stock, cut with the coordinating dies, and layered to create this simple but elegant card. 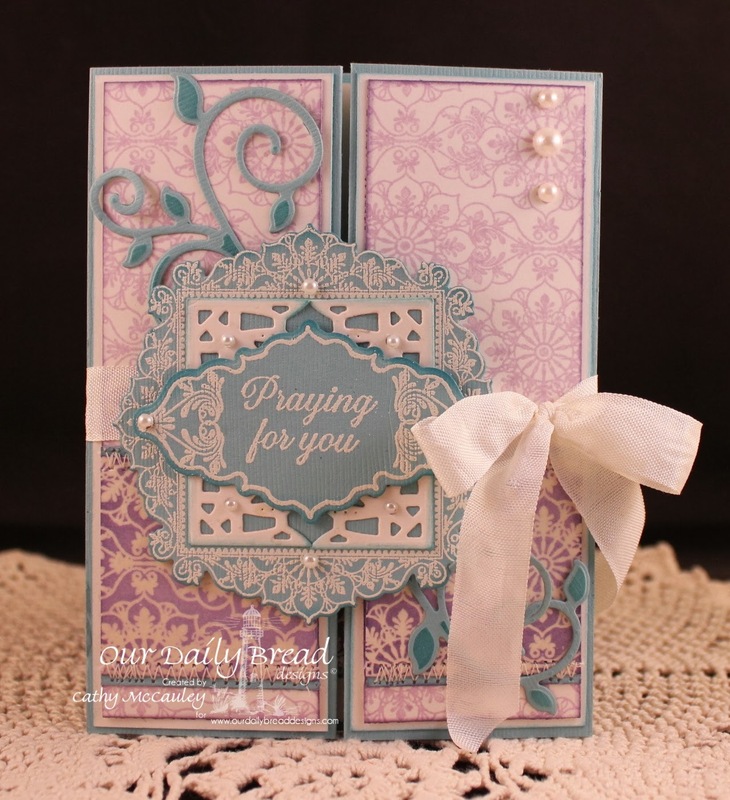 Creative Nugget: Two panels were made by clear embossing the Ornate Background on Mixed Media paper. The paper was spritzed with water and distress inks were added with a paint brush. Course salt was sprinkled on and both panels were dried with a heat tool. The salt was rubbed off with a paper towel creating a soft, subtle design. 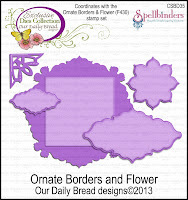 Spellbinders Curved Borders Two Dies were cut and embossed on an angle to make the border. Some seam binding was threaded through a hole punched in the little flower to make the corner accent. Fancy Foliage flourishes and a few pearls finish the card. 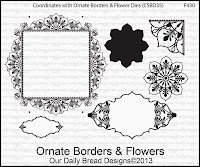 My third sample is just a quick, clean and simple card using the Ornate Borders and Flowers, Ornate Border Sentiments, and the Ornate Borders and Flowers Die. 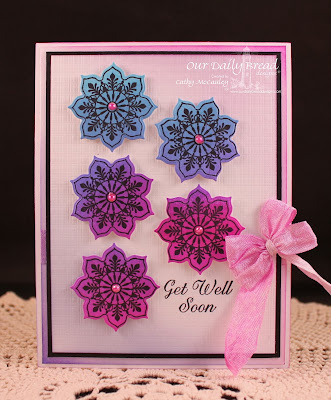 Creative Nugget: To get the variation of color on the flowers, they were stamped with a Kaleidacolor ink pad. To see all the gorgeous samples created with these beautiful stamp sets and dies in one place go to the Our Daily Bread Designs Blog...and be sure to leave a comment on my talented Sister Sticks' Blogs to be eligible to win the fabulous prize!